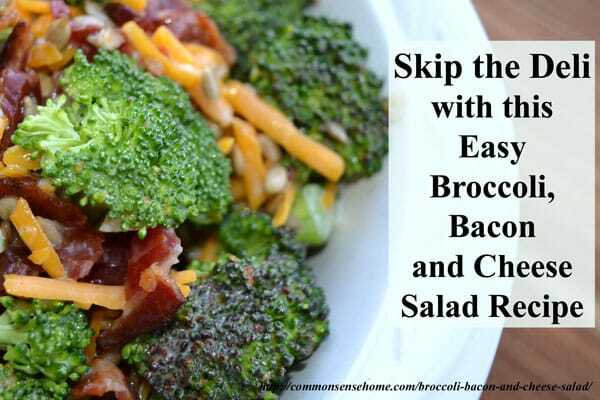 Broccoli salad is one of the few salads I'd occasionally pick up at the deli, but it's amazing how much better it tastes when you make it at home with really fresh ingredients. I served some of this up for my extended family at Easter, and my brother said it was so good he wanted to eat the whole batch. 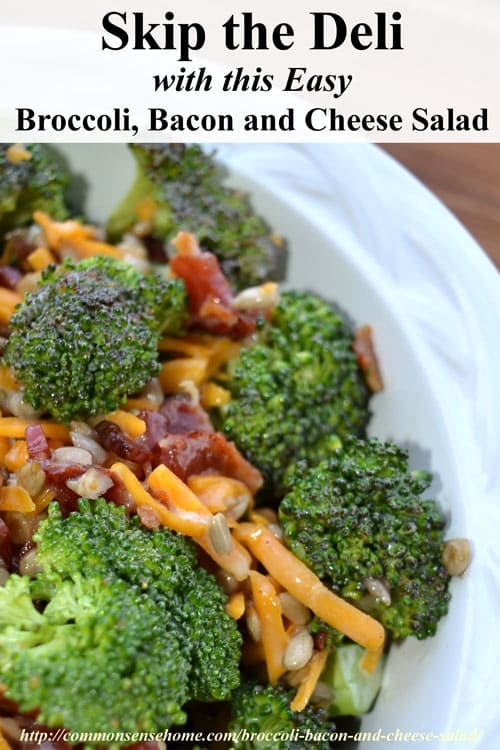 In a large bowl, combine broccoli, cheese, onion, bacon and sunflower seeds. In a small bowl, combine mayonnaise, sugar (or honey) and lemon juice. The original recipe I had used two teaspoons, but I accidentally used two tablespoons once and it was quite tasty. Mix dressing well and allow it to stand refrigerated for an hour or so. Just before serving, stir dressing well and pour over salad ingredients. Toss to coat. If your refrigerator space is tight, go ahead and mix the other ingredients with the dressing and place them together in the fridge. It's fine either way. If you like things a little sweeter, throw in some dried cranberries or cherries and use less lemon. Makes 9 (1/2 cup) servings. I love, love, love broccoli salad. It’s one of my addictions! I switch it up. Sometimes I make it with cheese and bacon and other times I make it with raisins and sunflower seeds. One of my favorite salads. So yummy. This is one of the BEST salads ever. It would even make George H. W. Bush reconsider. My mother-in-law makes it and I think she won me over with it. I’m going to match this up with her recipe and compare! Thanks for sharing with the world. Wow, this absolutely delicious. I’m definitely putting it on my menu plan for the coming week! Do you use the broccoli raw or steamed? I use it raw for this recipe.